Welcome to Spring Crescent Middle School. It's an overachieving, high-scoring institution, and all the grownups say you're lucky to be there. With a troublesome monster for a best friend. And some of those teachers sure have been giving you funny looks. 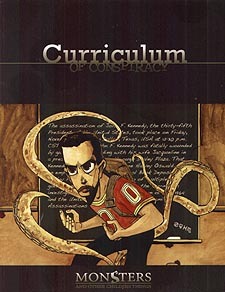 Curriculum of Conspiracy is a complete game setting and adventure for the rolplaying game Monsters and Other Childish Things. Curriculum of Conspiracy features dozens of enemies and potential allies, all of them alternately entertaining and creepy, and plenty of opportunities for monstrous action and suspense. There's the bell - time for home room. Have a nice first day at school.